A bit higgledy piggledy making it difficult to find somewhere to perch but there is plenty of covered outdoor space (more than there is actually in the pub. had the Facon Red which was one of the better brews on what was turning out to be a duff night for beer. I really like this pub. There is always a varied selection of well-kept ale, that keeps changing so there's always something new to try. Much of the beer comes straight from the cellar. It's a relaxed, friendly place, with a large beer garden (with heaters!). There's live music a few nights a week, and barbecues in the summer. On a couple of recent visits the beer ranged from OK to excellent, helped by being served flat and cool from the cellar. Lovely drinkers pub, and a great place to watch the olympics with a pint and scrachings. Very good pub, shambling and old-fashioned, it distracted me from looking for meat ends in the nearby Waitrose Deli. A beer festival was on with an excellent selection of ales, 43 listed. They also advertise in excess of thirty foreign beers on a board above the bar. Friendly staff who offered samples of their favourites. Toilets like the Public Health Acts of the Victorian era were never passed. I had Cottage Brewing Co's Howling and Tydd Steam Red Baron. Recommended. 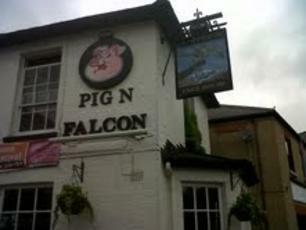 Now the Pig'n'Falcon have spent the last few years perfecting their ale, maybe they can sort out some of the things they've overlooked. The toilets, for a start, are woeful, and the garden heaters often don't work. When you ask, you're told "I have to plug them in, I'll do it in an hour or so". Not on considering it's impossible to stay inside the oub due to the excessive volume of the live music! Apart from that this pub is a winner and not to be missed, especially by real ale fans, and smokers will enjoy the large beer "garden".